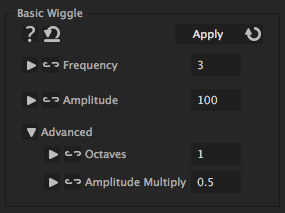 This is the most simple kind of wiggle. You just need to specify how fast (Frequency) and how much (Amplitude) it should wiggle and the iExpression then wiggles around the keyframed value. You cannot only apply it to positions of layers, but to any 1D, 2D, 3D or color property. Applied to the opacity of a layer, it causes a flickering, for example.